Durable and strong aluminum core that can withstand high winds. Polyester canvas is highly fade resistant. 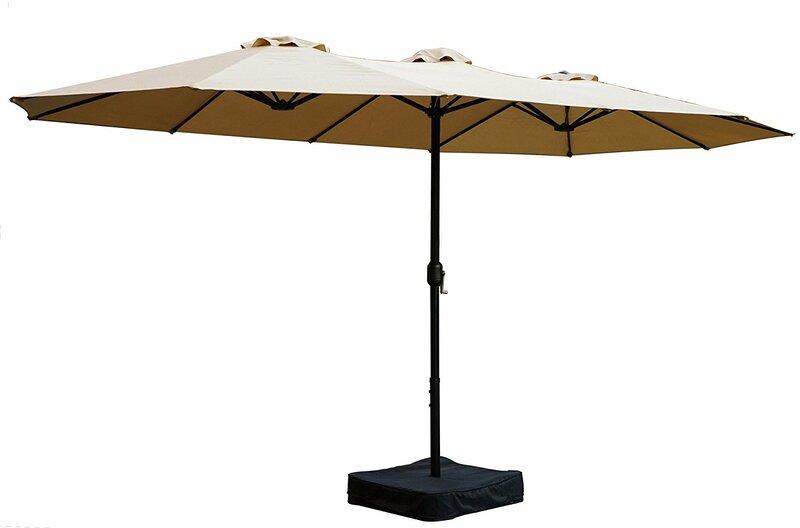 Umbrella top comes in a number of natural colors that blends well with outdoor spaces. LED lighting provides light to an outdoor space for all-night use with water-safe plug-in cord. 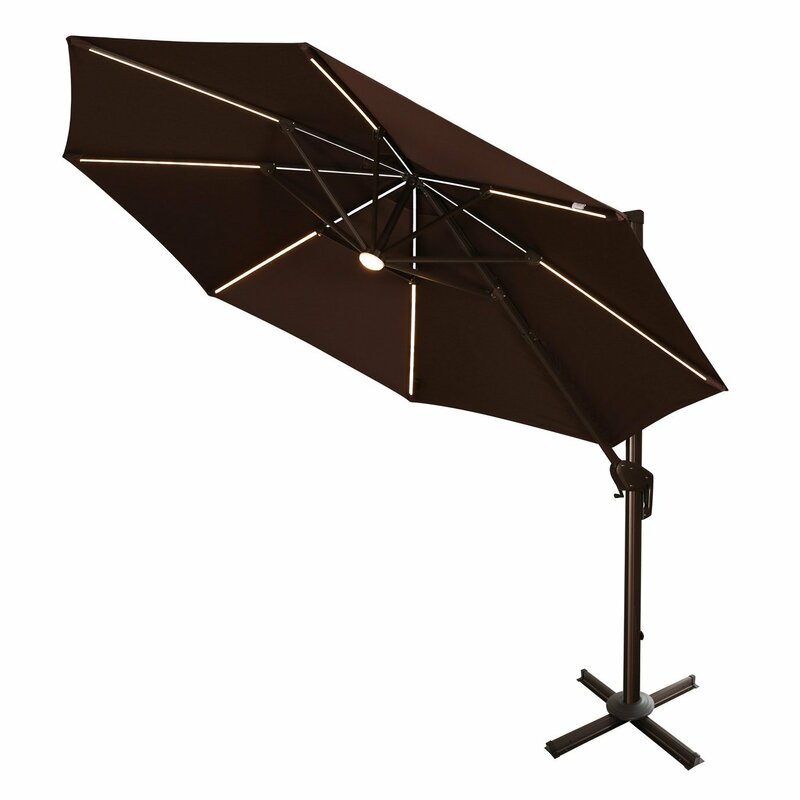 Single flap panels on umbrella fabric protects the unit from flying away or inverting easily. Can be a difficult set up for one individual alone. Some colors fade more easily after long durations of sun exposure than others. Extension cord and external energy source required for LED lights. 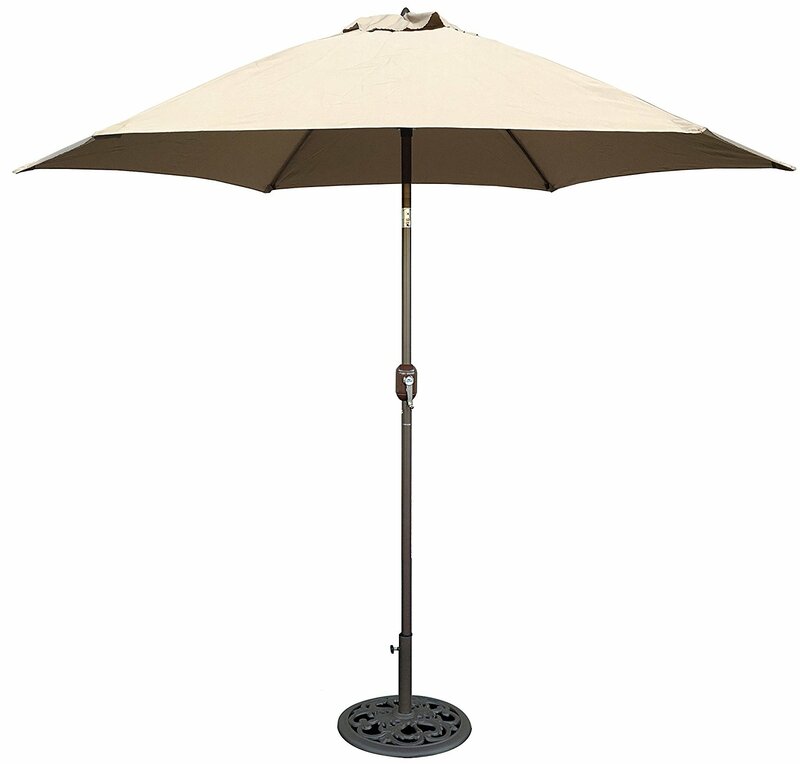 This is the summary of consumer reviews for Tropishade 9 ft Bronze Aluminum Patio Umbrella with Beige Polyester Cover. 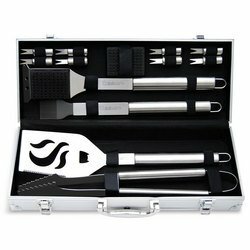 The BoolPool rating for this product is Good, with 3.80 stars, and the price range is $57.00-$89.00. 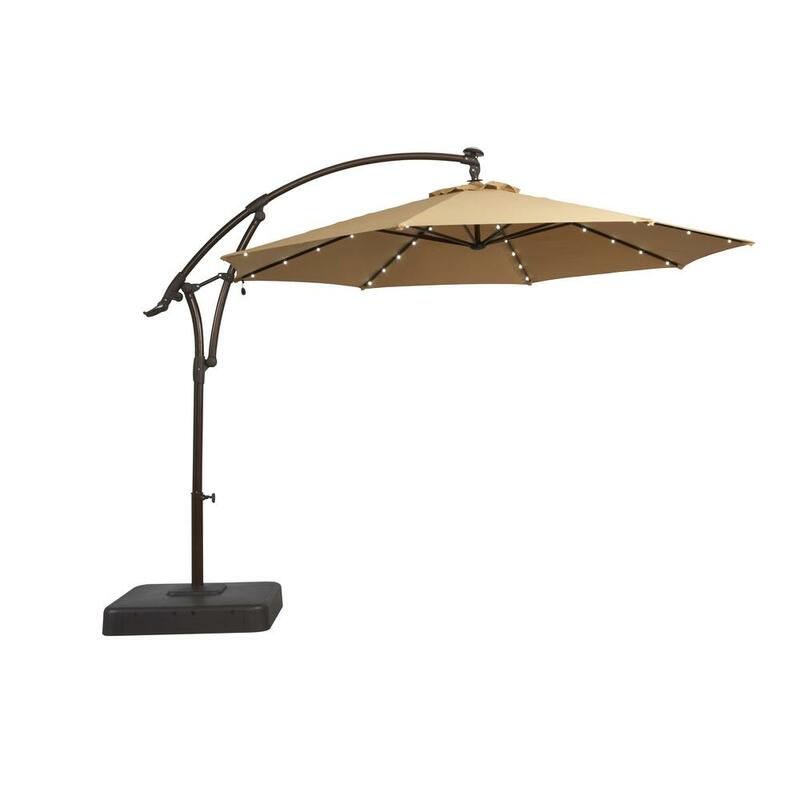 Overall, customers are pleased with the functionality of the Tropishade 9 ft. Aluminum Patio Umbrella with Beige Polyester Cover because of its fair price for the quality of large outdoor umbrella, and its special features like LED lighting and a remarkably durable polyester canopy. 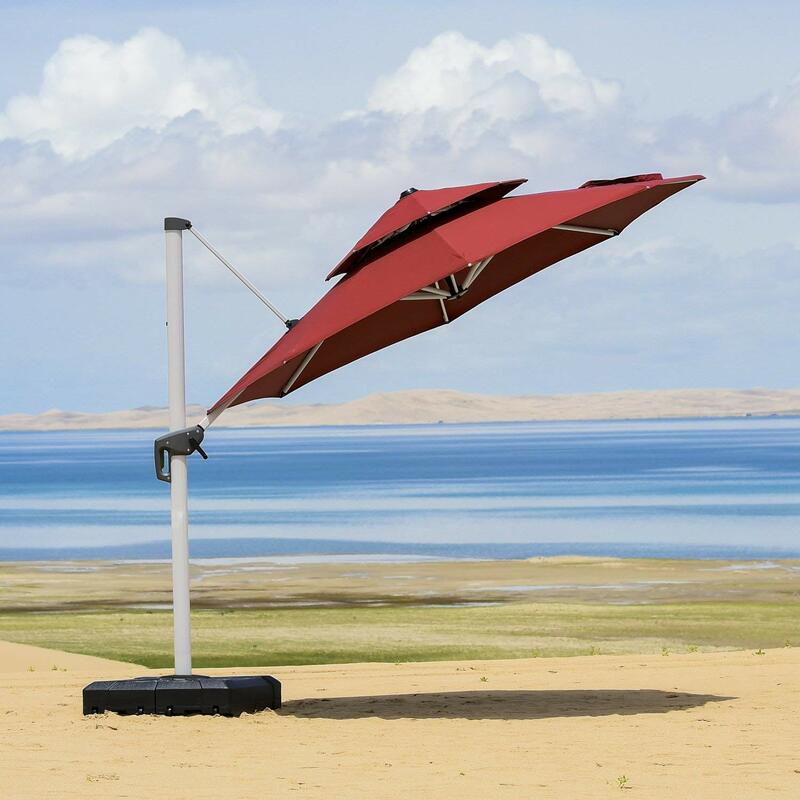 The product stands out from the rest in part because of its aluminum skeleton that is able to withstand high winds, some customers even saying their umbrella held strong through storms. The 9-foot umbrella is able to shade numerous people at once, making it a good investment for those looking to entertain frequently outside during hot or sunny conditions. One of the most popular features of the outdoor patio umbrella is the number of natural colors a customer can choose for the canopy, including beige, canvas, green, and rust, to blend in seamlessly with a backyard area or a patio. Customers also suggest the unit itself is more affordable than others in the market, especially compared to others that offer an inside LED light nighttime feature. For easy setup, the umbrella clicks together with the push of a button as the two aluminum poles slide together. Some customers have cited some issues with the product, including some who say their umbrella broke after just a handful of uses. These customers say the tilting mechanism jams frequently when trying to adjust the canopy towards or away from the sun. Also, darker canopy colors may fade faster than light beige colors over multiple seasons of use. The product is also known to break easily if it is handled roughly. 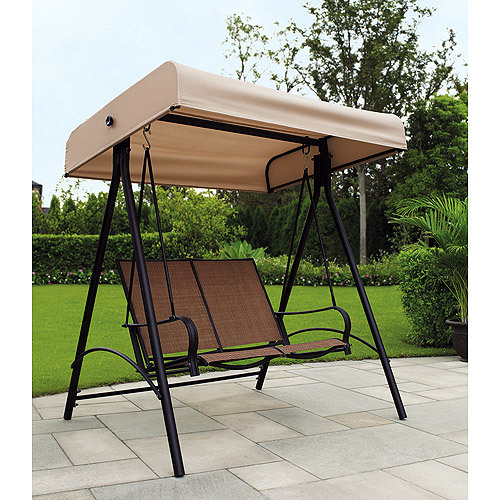 Overall, this product withstands weather well and is touted as a great addition to any outdoor space. 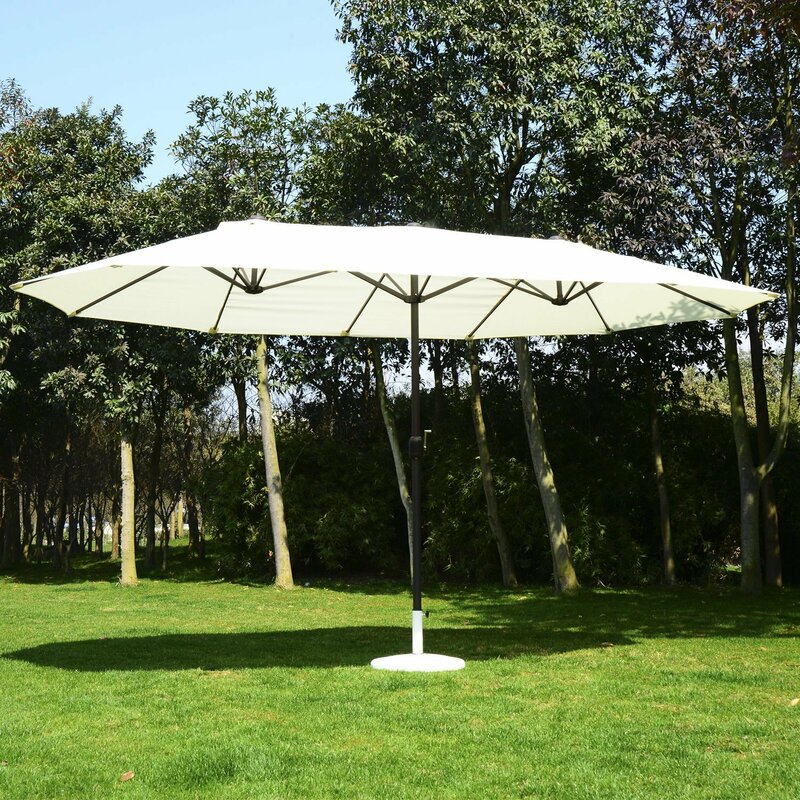 Both affordable and durable, the Tropishade Aluminum Patio Umbrella can also be bought alongside a heavy base to match for more wind protection. Probably the best deck umbrella we've ever owned. It matches my deck furniture upholstery and we've gotten a lot of nice comments on it. The tilt mechanism jams frequently and even when it doesn't, it's very difficult and painful for my very strong and young hands to slide the two steel parts into place to tilt this ridiculous umbrella. our other lighted umbrella that recently passed away, was solar....I guess I assumed this one was too.....It aint...you've to find away to run an extension cord to it.....kind of an ugly pain. I didn't set up the umbrella this this weekend when it was warm out, the upper pole was broken and the part the lower pole goes into was bent. Fabric is thick enough to avoid tearing or ripping. Reading other reviews about the fading issue, I thought I'd try to avoid the problem by treating the fabric with some UV fabric spray for outdoor furniture. In time, fabric is will fade. However, the fabric fades quickly in the sun, hence the 4-star review. Even Formosa Covers, the fabric seller doesn't know if this fabric replacement cover will work with this umbrella, except to say it should fit a 6-rib model as long as ribs are 52-54 inches. It looks like this isn't the kind of fabric that's resistant to weather or sun. I'm not impressed by the fabric. The fabric is a little more nylon than the heavier canvas-types but it works fine and is just as sturdy. The fabric is very cheap and almost translucent. It stood up well all summer during a couple of windstorms as well when we hadn't had time to lower it. Broke the first time we opened it. Probably used it 5 or 6 times after that for up to 2 hours each time. First off the umbrella looked great and shipped on time. The second time I used this the string snapped and now it doesn't work. It's stood up well all summer during a couple of windstorms as well when we hadn't had time to lower it. Used the umbrella the first time on Memorial Day weekend. The first time I attempted to raise the shade (mid May, 2014) the hoist cable broke and there was no instructions on how to replace it. The second time we attempted to use it was 2 days ago, on June 21. We bought 4 of these umbrellas and only needed 3 at the time. The second time that I used it the cord that controls the opening and closing of the umbrella broke. They're light enough for me to handle, but flexible during high winds. The winding handle worked fine for raising and lowering the umbrella shade. But, sadly, the umbrella pole failed in a light to moderate wind gust. You'll need to lower the umbrella if the wind tops 10 mph. I got stupid and left the first one out during a wind storm and the pole bent 90 degrees. There was no wind on the day that she used it so I don't know how it'd do in a strong wind. (I do recommend closing it if a wind/rain storm is approaching.). Oklahoma gets intense wind and sun and this umbrella has withstood both very well. Not as sturdy, will fall over more easily with a good wind gust, material seems a little flimsier. If the wind picks up you'll no longer have an umbrella. It worked great for keeping the sun off and worked great after dark to provide just a tiny little bit of light without having to have the porch lights on. The lights look like they'd be very nice and I was excited about them... however the place the lights plug in is covered by my table and umbrella stand..
Plus, the lights are pretty bright, so flashing is pretty uncomfortable. I bought this in May 2011 to provide a little bit of light at my outdoor bar. The lights were the ENTIRE reason I purchased this umbrella -- I didn't even care that they required plug in and weren't solar. It's 2 section of poles and just plug it in. It come with a power adapter with about 18 ' long to provide the power for light. I do think it's pretty, lights and all, just not functional. The flashing mode is enough to induce a seizure but steady on provides enough light to see what your eating at night. The color is rich and beautiful and blends in perfectly with the natural colors in any backyard. Loved it at first, but the color faded right away. Fabric color faded unacceptably after first year of use. Changed my review from 5 stars to 1. I've had this umbrella in the California sun from April 2015 and it's now 5 months old and terribly faded....I loved the original color. i looked at the color on the side exposed to sun everyday and noticed how they HAVEN'T faded at all. Better to choose a beige or light yellow color, if you're looking for a solid-color umbrella that'll work uniformly with whatever color cushions make up your patio set. Color is perfect....no negatives after 2-weeks. This umbrella after one summer has faded terribly in some sections. We live in Florida, so the sun is bright here; it does fade. Built with quality, especially for the price. For the price its great couldn't find a umbrella at any other store to match the quality and price of this umbrella. Fine umbrella especially for the price. Good sturdy umbrella and the price was right. Otherwise a great product for the price. Great purchase for the price!. The price was compareable to other stores near.me, that'd cheaper fabric. Good product for the delivery time and price. This's a pretty good quality umbrella for the price. Excellent construction, LEDs are nice and bright, and looks beautiful on our deck. It's well constructed and looks wonderful. I'm so sad because I really loved the look, but unfortunately looks mean nothing when this product didn't even make it through the summer. Great looking rusty red orange color just as pictured. Nice looking umbrella and it functions well, however, after one season we noticed that the color was fading in the sections which folded inwards, so now it looks like it's stripes. Looks awesome at night too!. Actually we were looking at it last night and my wife said 'it still looks brand new'. Just what we were looking for!. Lights worked and it's a fine umbrella. works well, lights up perfectly, well made. Lights work great and are plenty bright. Looks good, doesn't rely on solar for light to work. I ordered 2. Both work as expected and actually light up the area pretty well. works great, but lighting didn't last long. The lights worked when the umbrella arrived. Crank and tilt are both working fine. These lights shouldn't have stopped working after only six weeks. It's cheap, lights well, and looks great. Lights has three modes . The LED lights color isn't very impressive, it's yellow-orange color, like the traffic lights. The lights are really cool. We love the light features. Back to the umbrella, We're impressed by the perfect level of light the LED lights project and our daughters are amused by the different modes that allow for blinking lights.Unfortunately, it does need to be plugged in for the lights to work. The lights are really bright and pretty. But for some reason the little red light doesn't want to share that power with the LED lights. Lights can be brighter then my last unit, sometimes at night you need more light. It's not an LED light.